iOS 10 includes the biggest batch of new Messages features since, well, ever, including new tapbacks, bubble and screen effects, handwriting, annotation, Digital Touch, plus the fastest and easiest way we’ve ever seen to replace words with emojis. The Messages app in iOS 10 also introduces a new open architecture and built-in App Store for third-party add-ons, including stickers and additional emojis. To comment on a message with a tapback: Press and hold down on the message until the tapback bubble appears. Tap an icon to affix it to the message (left); the recipient sees this (right). If you change your mind and want to dismiss the tapback bubble without adding a tapback icon to the message, just tap the screen anywhere outside the tapback bubble. To replace text with an emoji: Type your message and then tap the emoji keyboard icon. As soon as you do, words that have associated emoji turn orange; tap an orange word to replace it with an emoji. If the word is associated with more than one emoji, you’ll see multiple emoji in a bubble; tap the one you want and it replaces the word. 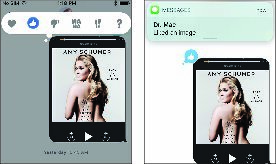 To add bubble or screen effects: Prepare your message as usual but rather than tapping the little up-arrow-in-a-blue-circle to send it, press and hold down on it for several seconds and the Bubble and Screen Effects screen appears. 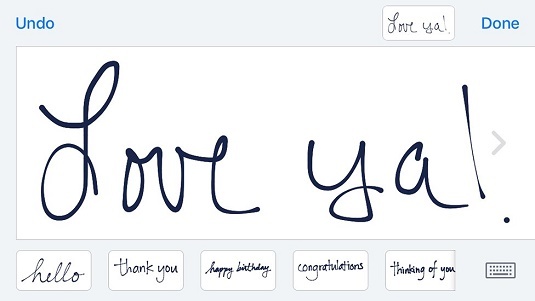 Tap the Bubble tab at the top to select Slam, Loud, Gentle, or Invisible Ink as the bubble effect for your message. Or tap the Screen tab and swipe left or right to select Balloons, Confetti, Lasers, Fireworks, or Shooting Star as the screen effect for this message. If you change your mind and don’t want to add an effect, tap the x-in-a-circle to dismiss the Bubble and Screen Effects screen. To send a handwritten message: Sometimes nothing but a handwritten note will do. To send one, first rotate your iPhone 90 degrees so the long edge is parallel with the ground (landscape mode). If the handwriting interface doesn’t appear when you rotate the iPhone, tap the handwriting icon in the lower-right corner of the keyboard. The secret to handwriting messages is turning your iPhone sideways. Tap a preset message at the bottom of the screen to use it or just start writing in the big white area (where it says, “Love ya”). If you fill the message area with text and want to add more white space, tap the > on the right side of the screen. 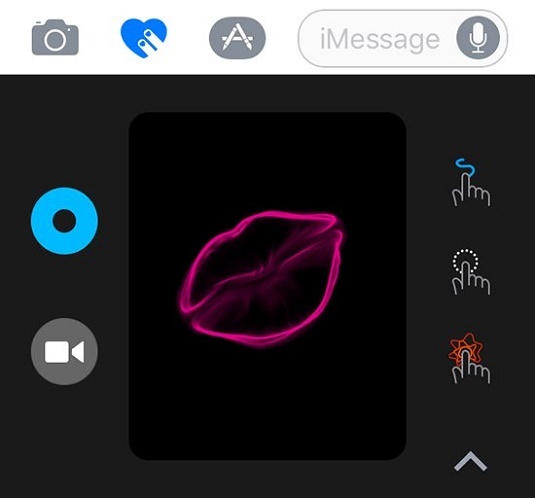 To send Digital Touch effects: Digital Touch effects were introduced on the Apple Watch and have spread to the Messages app. To use them, tap the Digital Touch icon on the left of the text field to reveal the Digital Touch interface. The Digital Touch interface ready to send a kiss. To expand the Digital Touch interface to full-screen: Tap the caret (^) near the lower-right corner. To sketch: Draw with one finger. To send a pulsing circle: Tap with one finger. To send a fireball: Press with two fingers. To send a kiss: Tap with two fingers. To send a heartbeat: Tap and hold down with two fingers. To send a broken heart: Tap and hold down with two fingers, and then drag down. To switch ink colors: Tap the big blue circle on the left to reveal additional colors. To add a picture or video to your Digital Touch effect: Tap the camera icon on the left. Digital Touch messages are sent automatically, so don’t tap or press the screen in Digital Touch mode unless you really mean it. Last but not least, Messages in iOS 10 has a built-in app store so you can buy (or download for free) sticker packs, new effects, and who knows what else. To get some free stickers and see what other third-party add-ons are available, tap the app icon to the left of the text field. Once you’ve acquired apps, this is also where you access them. So, for example, to send a sticker from a sticker pack you’ve downloaded, you’d tap the app icon, swipe left or right (if necessary) to locate the appropriate sticker pack, and then tap a sticker to send it.